As the great Bill Shakespeare once said, “What’s in a name? That which we call the Alpinestars SMX-6 v2 Gore-Tex Boots by any other name would perform as sweet.” I didn’t pay a lot of attention in high school, but that always stuck with me. 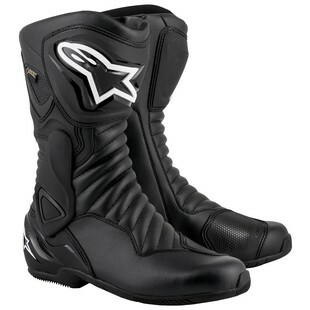 That said, if they did have another name, you could more confidently recommend them to your friends and not just say, “Well, it’s one of the Alpinestars ones.” I mean, sure, you could stand in front of them and talk about the new compound rubber sole that increases feel, grip (even in wet conditions) and durability. You could tell them Gore-Tex can’t be beaten for waterproofing. You could even kindly detail how confident you feel with TPU protection in the ankle, heel, calf, shin, and on the shift pad and toe. You could even regale them with stories of unheard of comfort thanks to the accordion flex zones at the achilles and instep. Yes, you could say all that, but you won’t have to. Just list a series of letters after Alpinestars and tell them to get a hold of a Gear Geek at RevZilla. We’ll hit them with some silky Shakespearean prose real quick about these boots.